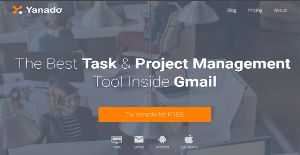 Yanado is an innovative task & project manager designed for Gmail users. It developed a unique concept for managing projects within email service providers, so that companies would skip paying for multiple systems, and save the time needed to migrate data between them. The simplicity concept spreads on the system’s neat and Gmail-adjusted interface, where no training or expertise is needed to perform complex operations. Currently, Yanado serves almost 2,000 teams worldwide, and manages approximately 20,000 projects and 500,000 tasks related to them. Satisfied customers describe it as a successful daily planner and organizer which allows them to transform emails into tasks, and complete those on dot regardless of the complexity of their workflow. On top of that, Yanado is a well integrated and reasonably priced system, which provides a free plan for small teams and single users. The unique concept of integrating project management with email service providers is definitely worth a try. The Yanado team developed it with the idea to save users time and finances: customers are not only enabled to govern their product using their Gmail account, but also monitor the progress of each task and each team performer. Emails are collated into comprehensive to-do lists, so that each change or project update would be notified to users in real time, and the users can activate due dates and reminders for prioritized activities. All work is displayed in simple Kanban cards, so that users won’t miss any of their important assignments. Collaboration is another strong feature Yanado has to offer, as users are empowered to discuss task details in real time, delegate assignments to more competent agents, and share files way easier than attaching them to individual inbox messages. All tasks can be divided in smaller subtask units for users to stay in control of the tiniest details of their work. As we already mentioned, all activities will be collated in a comprehensive database, and tagged for more visibility and facilitated searching. Another way in which Yanado makes project management easier is by being fully mobile optimized, meaning that users can regulate work outside the office using their standard Gmail credentials. At the same time, Yanado integrates with all related Google services (Calendar, Contacts, Drive), Salesforce, Slack, and Github. What Problems Will Yanado Solve? Responding to and organizing email inquiries: It’s Thursday and Edwin is swamped with email inquiries from his website. Edwin is a CEO of the online rental web portal where people come to search for properties to rent for weekend. He has few hundreds inquires and some of those are last minute calls for upcoming weekend and some for later in the month. He has created labels in his Gmail, sending back and forward emails to his team members trying to stay on top of things. But it’s so easy for inquiries to fall through the cracks in such mess. If they do, they lose money and get angry reviews from their clients. To help his company find balance and organize such mess, Edwin found Yanado. Yanado’s flexibility allowed him to create sales pipeline for email inquiries the way it suits them. For each email inquire his team creates a task, add that task to proper list and assign to proper member of the team. Now, entire email communication with prospects and team members are easily traceable within the task, one click away. No more angry clients, revenue increased and Edwin can finally relax. Turn emails into task. Manage repeatable work on time: Pablo is the owner of the accounting agency that has 10 employees and 200 clients. It’s the last week of the month and Pablo and his team are struggling to see what reports they already finished and what left to be done. They are looking over sent emails, paper stickers all over the office to understand where they are. Few days later Pablo and his team adopted Yanado. Yanado customer success team helped them onboard entire company. They created a list for each of their customers, imported thousands of recurring tasks and assigned them to appropriate employees. At the end of the next month, Pablo and his team were are able to exactly see what reports/tasks they have completed and what tasks needs to be done. They haven’t missed a single deadline and their clients are happy. Pablo is smart. Be like Pablo. Recurring tasks and group by due date. Make sales reps more efficient: Ron is a VP of sales at a SaaS B2B company. He is constantly working on getting his sales reps more efficient. They spent too much time on data entry into their CRM and he is looking to reduce that time in favor of selling. More time they spend doing data entry into CRM, more money they leave on the table. Ron knows that majority of time his reps spent on replaying and following up emails from their Gmail. Together with Yanado customer success team, he integrated Yanado with their CRM. Now his sales reps have everything in one tool they love – Gmail. They can manage their pipeline, send personal emails directly from Gmail to their prospects all while those emails are automatically added to Yanado and their CRM. They can easily schedule next steps within Yanado and everything is automatically synced with Google calendar. All fields from CRM are mapped to Yanado custom fields so that sales reps can easily see everything they need to know about the prospect once they open a task. With Yanado custom statuses they have pipeline 1-1 with their CRM pipeline. Time saved, reps are happy, more money for the company. Custom statuses and custom fields. It's essential to note that hardly any software in the Project Management Software category will be a perfect solution able to meet all the requirements of different company types, sizes and industries. It may be a good idea to read a few Yanado reviews first as some solutions can excel only in a really small group of applications or be prepared with a very specific type of industry in mind. Others may operate with an intention of being easy and intuitive and consequently lack complex functions welcomed by more experienced users. You can also come across solutions that focus on a broad group of customers and provide a rich feature toolbox, however that usually comes at a more expensive price of such a software. Ensure you're aware of your requirements so that you get a software that provides all the functionalities you look for. How Much Does Yanado Cost? We realize that when you make a decision to buy Task Management Software it’s important not only to see how experts evaluate it in their reviews, but also to find out if the real people and companies that buy it are actually satisfied with the product. That’s why we’ve created our behavior-based Customer Satisfaction Algorithm™ that gathers customer reviews, comments and Yanado reviews across a wide range of social media sites. The data is then presented in an easy to digest form showing how many people had positive and negative experience with Yanado. With that information at hand you should be equipped to make an informed buying decision that you won’t regret. What are Yanado pricing details? What integrations are available for Yanado? If you need more information about Yanado or you simply have a question let us know what you need and we’ll forward your request directly to the vendor.